Skye Bolt has heard the word in connection with his baseball career so often, he sometimes knows it's coming before anybody even says it. "I've run into that word a time … or 12," he said with a laugh. "It's a cliché. … It's something that motivates you and something that angers some guys and gives you an extra push, and it's something you want to grow and work out of." Growth and work are two things the 24-year-old exhibited in 2018 as he put together by far his best season since being selected out of the University of North Carolina by the Athletics in the fourth round of the 2015 Draft. After three middling pro seasons, the switch-hitter put up a slash line of .260/.347/.474 at Class A Advanced Stockton and Double-A Midland. His 19 homers and 19 steals were both career highs, and his walks were up while his strikeouts decreased from 2017. That led to an assignment to the prestigious Arizona Fall League, where he went 3-for-8 with a homer and a stolen base over his first two games for the Mesa Solar Sox. "It's not like Spring Training, when you ease back into live BP with some guys in the organization," the Georgia native said of coming to the AFL. "You just get thrown into the fire with the best guys in the country. You can't be passive, because these are elite guys who all trying to showcase their talent. It's a battle from pitch one." 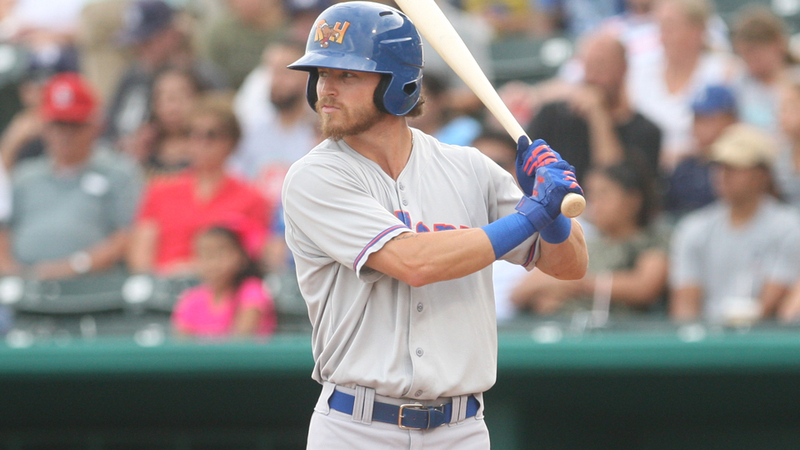 Bolt attributed his successful season to a change in approach and the guidance of RockHounds hitting coach Tommy Everidge. "Just a byproduct of being more aggressive," he said. "It was just a byproduct of 'I'm going to let it eat; I'm going to let it fly,' but it all stemmed from my hitting coach. I've been fortunate enough to have the same guy for two, three years now. He knows my swings and my ups and downs and what causes them." "Ups and downs" would aptly describe Bolt's baseball career up until 2018. Hence the enigma tag. He was a prep star at Holy Innocents' Episcopal High in Atlanta, and there was industry speculation that he could end up being a first- or second-round pick in 2012. Instead, the Nationals chose him in the 26th round and acknowledged being surprised that he was still available. But the 6-foot-3, 190-pounder knew he still had a lot of maturing to do. "I had a junior and senior year of high school … where I really grew physically and maturity-wise and in strides that I never expected to, in such a short period of time," he said. "I was a smaller guy -- not an underdog story by any means, not overlooked -- but I wasn't the player that I ended up being my freshman year of college, and the year and a half of growth between junior year and senior year of high school was just astronomical. "I grew five, six inches, started growing into my body a little bit, gained about 20 pounds and baseball became a little easier. I started banging the ball around. It all happened fast. Long story short, there were talks that June Draft of being a first-, second-round guy, and that was what I was prepared for. But it didn't work out as far as the slot, a number that was something that I thought I would forgo my college experience [for]. You can always go back and get your education, but you can't always go back and do college." Bolt was also a quarterback in high school but said he only got gridiron-related interest from smaller schools and his college decision was an easy one. "Carolina was the best option I could have picked," he said. "I would pick North Carolina again, if you take me back to that time period; the education, and they were on the upswing, they'd been to Omaha [for the College World Series] six times, four of which were in the past 10 years. ... I played my best when the competition is at par if not better than I am. I wasn't going to go somewhere that I felt comfortable. ... I wanted somewhere where I was going to earn a spot." Thanks to some tough love from Tar Heels coach Mike Fox, Bolt did more than earn a spot in his first year in Chapel Hill, garnishing Freshman All-American nods from several publications after hitting .321/.418/.491. However, the next two years brought struggles and uncertainty before the A's -- tantalized by his tools -- used a fourth-round pick on him after his junior season. "Athleticism, speed, bat speed, the ability to play center field, the classic contact speed, center field profile," said Athletics assistant general manager Dan Feinstein, listing the attributes that drew Oakland to Bolt. But as was the case in college, he had difficulty translating his talent to game scenarios. "The hardest thing for me, the pivotal point, was the physical aspect," Bolt said. "Mentally, I was there. Everybody says, 'Routine, routine,' but you don't know what that is until you're thrown into it. Basically, it means taking care of your body and your mind every day. ... The biggest part of that transition for me was understanding that I have to do more than the next guy as far as keeping my body ... strong. "Strength has been the biggest obstacle or biggest challenge with me in pro ball. I'll fluctuate 10-12 pounds, sometimes 15 at some point, being as lean as I am. Speed has always [been] my game, but speed doesn't carry you very far if you're not on the basepaths." That proved true in his first two years as a pro as he hit in the .230s and only got on base about 32 percent of the time. He admitted doubts about whether he was cut out for pro ball crept into his head. "Absolutely. I think you can ask any ballplayer, except for an elite few, and those are the traps that guys sometimes fall into, is comparing themselves to the elite few instead of what they believe in themselves that they themselves can become," he said. "And, yeah, it creeps into your mind. It absolutely does. That's any profession, I believe. Guys run into roadblocks, and that's where you develop as a person. Male or female, whatever profession you're in, that's where you grow. "You think to yourself, 'What the [heck] am I doing?' It absolutely happens. 'Am I strong enough?' 'Am I physically capable enough for this game?' And then you look at [Astros star Jose Altuve] and you say, 'OK, that's not a problem. This dude's figuring it out, so how do I figure it out?'" For Bolt, the change began in the second half of 2017 with Stockton. His power started to show up -- he slugged .458 in August. He started to trust himself more. "I'm not going to say I figured it out quick, but it seemed that the progression of my career so far, not until the middle of last season, did I start to ... understand and adapt and do what I needed to as far as nutrition, and as far as getting in the weight room four, five times a week to maintain my body. "It became less [about] what is expected of me and more of, 'This is what I provide. This is what I do. I'm going to go do it. You guys can talk to me in the offseason -- talk to me as you see fit -- but I'm going to do it this way.'" But, obviously, the Athletics were pleased with the results. "We were really encouraged by the progress he's made," Feinstein said. "He had a bit of a rough start in Midland [this year], but he went back to Stockton and when he came back to Midland, he built off the confidence he had there." A fourth year in the Minors can be a pivotal season for a player, especially when the first three years are inconsistent. But Feinstein said the A's never looked at Bolt's situation as though his time was running out. "It's not fair to place expectations on somebody because of what their tools are," he said. "Every person and every player develops at a different pace." A Major League career now seems like an achievable goal for Bolt, and both the team and the player believe the AFL is a great opportunity. "It's fun to get to see new guys, have new topics of conversation. It's like expanding your Rolodex," Bolt said. Feinstein believes the challenge will help Bolt grow as a player. "The Fall League is a perfect environment for Skye," he said, "because it's going to allow him to focus his play, to see the ball well and to fret less about the result."